I did of course grab the camera and hit the patio in our backyard. Took a couple hundred frames on the spot. Today I stacked & sharpened the images, and got that as a result. The photo was taken using my Canon t2i, with a Sigma 2x tele-conveter and a Sigma 70-200mm (@200mm) at f4.0 / ISO 100 / 1/640 exposure. It’s not the first time I’ve taken photos of the Moon. 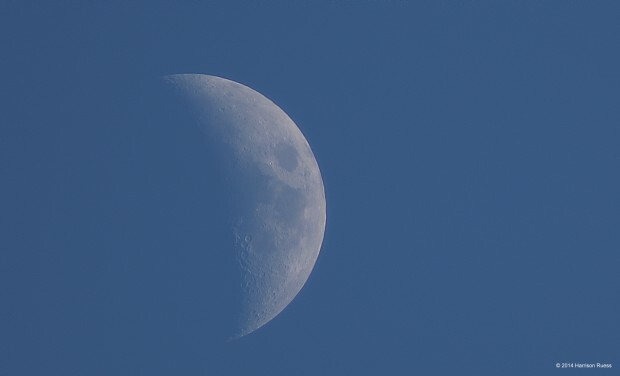 That one was one of the first good shots I got of our celestial neighbour through my (at the time) new telescope, with the Canon attached to it. That one is a single frame. Of all the amazing sights in the sky on a nightly basis (and in the Moon’s case, occasionally on a daily basis) the Moon is one of my favourite objects to look at. I’m also not entirely sure why. It’s not the most challenging to photograph. It’s not the most distant by any means. Though maybe that’s why I enjoy it: it’s accessible. Heck, people have even been there. And so perhaps I have a stronger sense of connectedness to it. I look up at the moon and wonder, when will we be going back, and who will that be? Our neighbour in the Cosmos. Christmas 1968 was a special one. 1968 started as a troubling year. The strife included an unpopular war in Vietnam. The world also witnessed the assassinations of Martin Luther King Jr. and Bobby Kennedy. But Apollo 8’s six day journey to the Moon and back might have saved the year. The mission’s ability to bring people together was a remarkable, lasting trait. And at a time of year when we’re liable to get a little bit caught up in the madness of the holiday season, it’s worthwhile to look back and to remember the wonder of Christmas at the Moon – and how this flight still touches us all today. Apollo 8 launched on December 21, 1968 with a three man crew: Commander Frank Borman, Command Module Pilot James Lovell, and Lunar Module Pilot William Anders. Both Borman and Lovell had flown into space before during the Gemini program; Anders was on his first flight into space. For all three men though, and indeed for all of humanity, ‘firsts’ was the keyword of the mission. This was the first launch from the John F. Kennedy Space Center in Florida – adjacent to Cape Canaveral. Apollo 8 was the first manned mission to leave Earth orbit. It was the first manned mission to the Moon. The crew was the first to orbit the Moon and see its far side directly, with their own eyes. And perhaps most majestic of all, Borman, Lovell, and Anders were the first three human beings to see Earth in its entirety, all at once. This is by the simple fact that they had gone further away from home than anyone ever had before. Not bad for a Christmas vacation. For Apollo 8, besides the risk of launch and just getting underway towards the Moon, the crew faced the added mystery surrounding if their engine would fire precisely enough for them to enter lunar orbit correctly. If the engine failed to provide enough thrust as they approached the Moon, they risked being flung out into the solar system and forever lost. 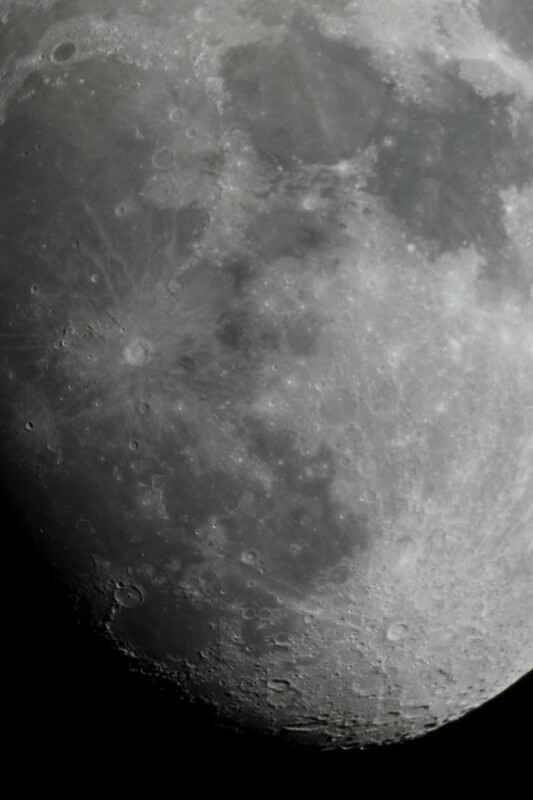 Too much thrust would result in an equally fatal impact on the lunar surface. On December 23, 1968 at about 6 p.m. EST after a picture-perfect four-minute burn of the Service Module’s main engine, Apollo 8 and her crew were in orbit around the Moon. And there they would stay for the next 20 hours, completing ten orbits around our nearest celestial neighbour. While in orbit of the Moon, the crew conducted a live television broadcast back to Earth on Christmas Eve. It was during this broadcast that the crew famously read a passage from the Book of Genesis. And even as a non-religious man myself, I appreciate the historical significance of reciting that particular passage in that particular place. Apollo 8’s Christmas Eve broadcast from orbit of the Moon was also, at the time, the most watched television broadcast ever. For NASA, while the Lunar Lander itself wasn’t ready to fly when Apollo 8 blasted off, this mission was an important one to test the Command and Service Modules to ensure they were capable of carrying crews to and from lunar orbit safely. The crew of Apollo 8 was also kept very busy while in orbit of the Moon taking pictures. They were required to survey potential landing sites for future missions – in particular the Sea of Tranquility where Apollo 11 would land some seven months later and humanity would leave its first boot prints on another world. In all Borman, Lovell, and Anders took more than 700 pictures of the Moon’s surface, and an additional 150 frames of Earth. To be able to come back home, the crew would once again depend on the engine to fire perfectly. So after a couple days cruising back towards our blue marble, on December 27, 1968 just before 11 a.m. EST, the crew of Apollo 8 splashed down in the south Pacific. For NASA the mission was a success because the crew came back safe, the spacecraft had performed well, they had gathered invaluable information about the Moon and potential landing sites, and last but not least: they were one small step closer to putting someone on the Moon. For humanity though, Apollo 8 may have left a more lasting impression. During this mission, we saw two things for the first time through human eyes: that we are all in this together, and that we are all a part of something much bigger. The first photo of the entire Earth – an image that we perhaps take for granted today – demonstrated clearly that there is but one planet Earth. No borders are visible from space. 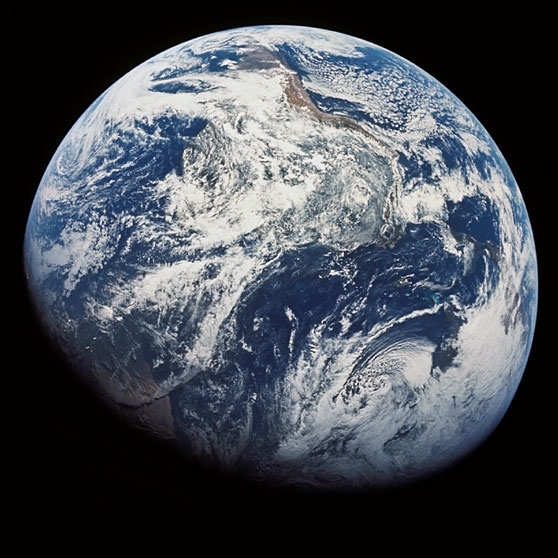 Just Earth – and all of us. 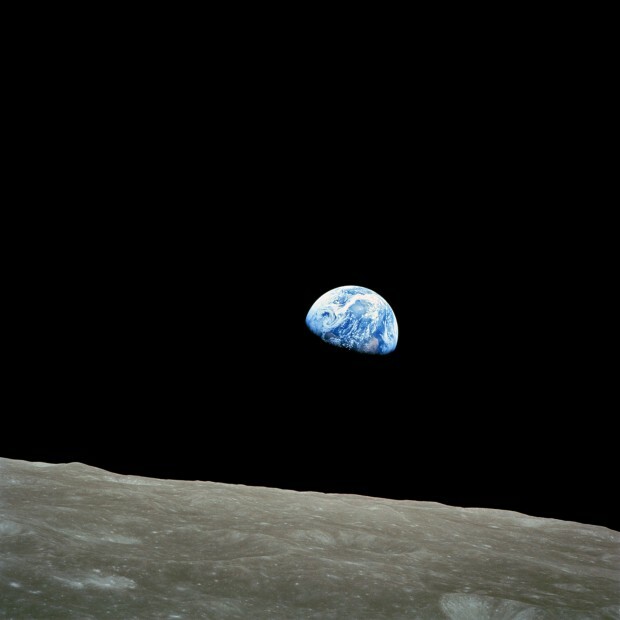 The other lasting image is one famously called ‘Earthrise’ – an image that the Apollo 8 crew captured as they came around from behind the far side of the Moon on Christmas eve. As they peered out their windows, our pale blue dot was visible beyond the horizon of the Moon. This offered a new perspective for humanity: our Earth as part of a larger system. Our Earth as a piece in a much larger puzzle. And as I think about this, I think I might understand why these two images resonated so deeply – and continue to resonate deeply today. They offer each of us a sense of connectedness. In the individual sense, it is comforting to know and realize that our experiences, challenges, hope, and dreams are not unique. Because, as evidenced by that picture of Earth, we’re not alone. In the larger sense, it is uplifting to be able to see our planet in the sky of another world. It’s encouraging to be able to realize we are connected to what’s happening around us. It’s amazing how all this came from just two photographs, taken 45 years ago, during a mission that many people today couldn’t tell you anything about. So during this Christmas season take a moment to remember what really matters in your life. Tell those important to you how you feel. We don’t have to go to the Moon to do that – and hopefully this Christmas can be special too. It’s the first Moon landing in my lifetime, and if you’re under age 37 it’s the first one in your lifetime as well. On Saturday, December 14, 2013 at 8:11 a.m. EST the robotic Chinese lander Chang’e-3, and it’s rover named Yutu, touched down safely on the lunar surface. 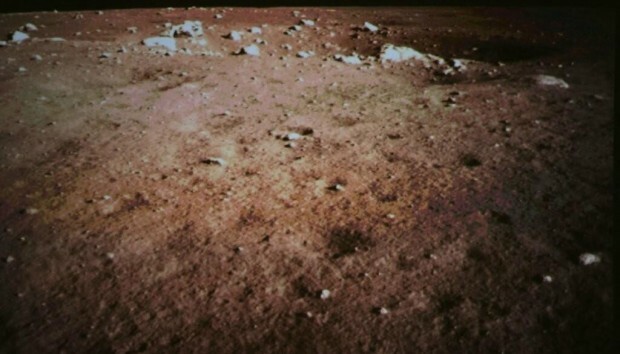 This historic landing is the first Moon landing for China, making them only the third nation to safely land a probe on our closest celestial neighbour. 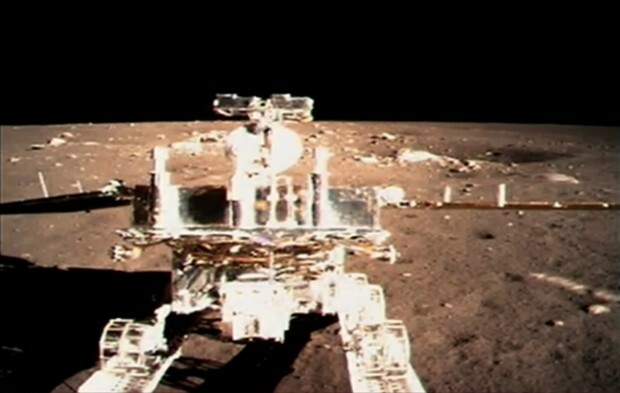 The Yutu rover successfully separated just after 4:00 p.m. EST. This is the first object to safely land on the Moon since the Soviet robotic mission Luna 24 landed on August 22, 1976. The last time humans were on the Moon was December 11-14, 1972 during the last of NASA’s Apollo missions, Apollo 17. This also places added historical significance on today’s date – December 14 – as it is both the last time a human was on the Moon in 1972, and today’s first Chinese landing. 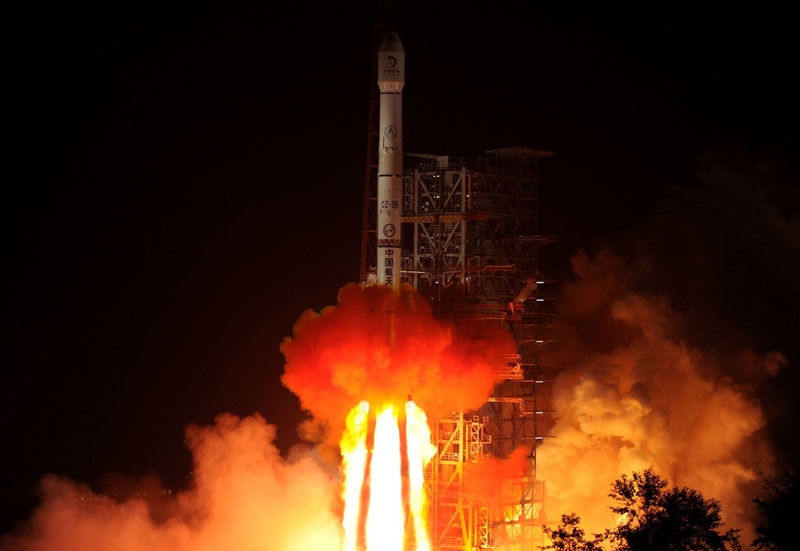 Chang’e-3 launched on December 2 and then took about four days to reach lunar orbit. 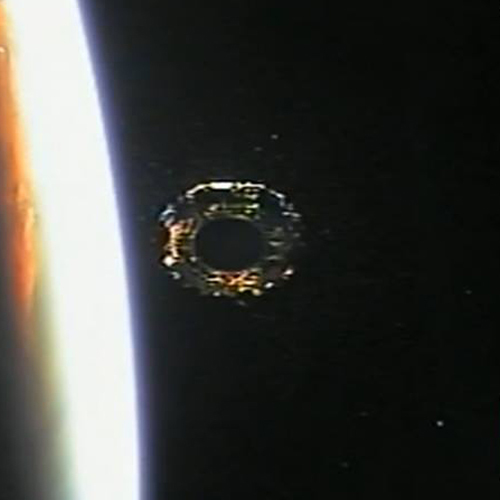 From December 6-14, the orbit was being adjusted in order to setup today’s descent and landing. Today’s landing, considered one of the biggest challenges of the mission, consisted of approximately 12-minutes of powered descent towards the surface. 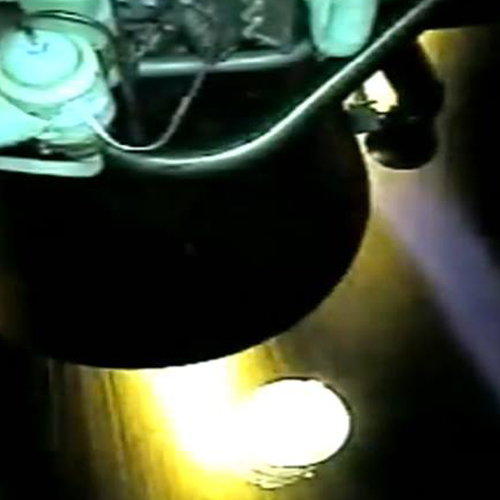 When the lander was just a couple meters above the surface, the engine shutdown as planned. This allowed the lander to float down safely, but also minimized the amount of dust that would have been kicked up if powered flight continued all the way to the surface. After landing the vitally important solar panels deployed successfully and began powering the lander and rover. When Yutu was deployed, it drove forwards onto a small ramp and was the lowered to the surface. All six of it’s wheels then drove off the ramp and onto the lunar surface, leaving clear tracks behind it as it slowly moved along. The touchdown happened in an area of the Moon known as The Bay of Rainbow. China’s first two missions to the Moon, Chang’e 1 and 2, were both orbiters. They had no intention of landing. 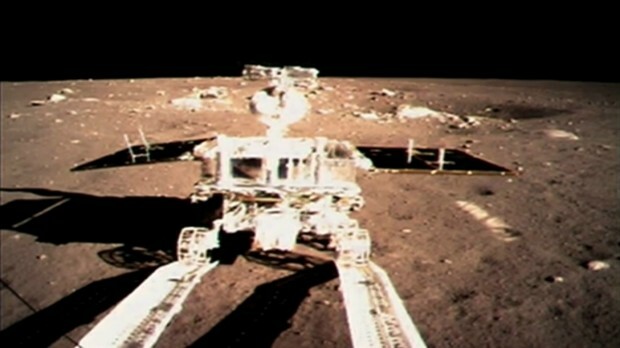 Chang’e-3 was the country’s first attempt at landing. In Chinese mythology, Chang’e is a goddess that travels to the Moon. Yutu, or Jade Rabbit, is her companion. 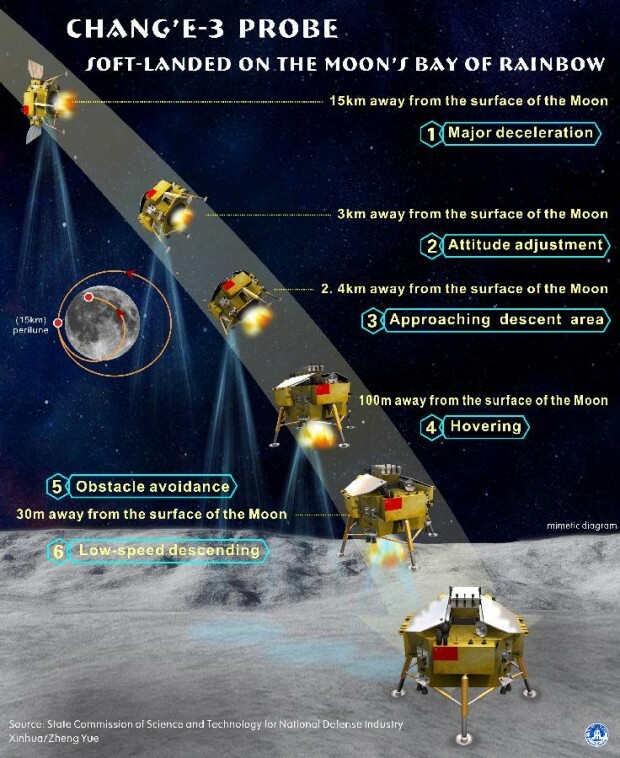 The Yutu rover is expected to operate for about three months while the Chang’e-3 lander should operate for about one year on the surface of the Moon. This article by Harrison Ruess also appeared on Sun News Network. Yutu is on it’s way to the Moon! In a spectacular launch reminiscent of the Apollo-era missions, China successfully launched a robotic mission to the Moon. On Sunday at 12:30pm EST (1:30am December 2, Beijing time) China’s space agency launched a modified Long March 3B rocket from the Xichang Satellite Launch Center in the Sichuan province. Atop this rocket sat the Chang’e 3 lunar lander and a rover named ‘Yutu’ – which means Jade Rabbit, the pet rabbit of the Moon goddess Chang’e. When the lander touches down in mid-December it will be the first soft landing on the Moon since the Soviet probe Luna 24 touched down on the lunar surface 37 years ago. 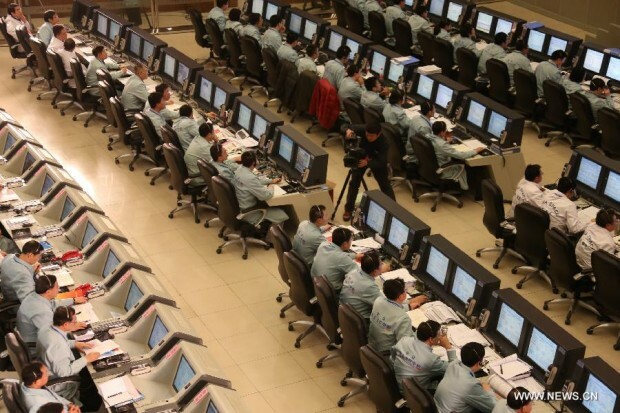 A live English-language webcast allowed viewers around the world to follow the launch. The broadcast was provided by China’s state-run television network CCTV. The three-stage Long March 3B rocket was 55m (185 feet) tall when it launched, or about the height of a 15-story building. 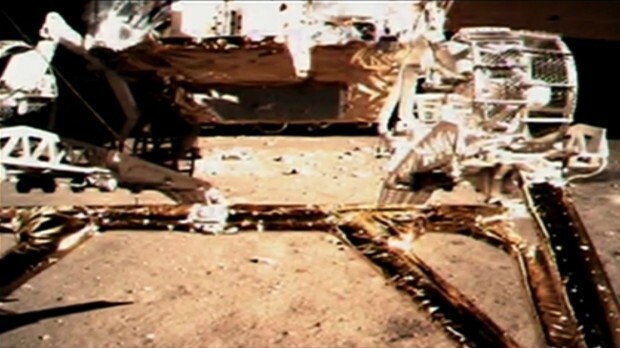 Following separation from the rocket, Chang’e 3 successfully deployed its landing legs and solar panels. On December 6, Chang’e 3 will fire its engines to enter lunar orbit. This will set up a December 14 landing. Coincidentally, December 14 is the last day a human was on the moon. This was during the Apollo 17 mission in 1972. The Yutu rover is powered primarily by solar panels; however it also has a small nuclear power source to provide heat to its instruments during the Moon’s nights – when the temperature drops to a chilling minus 170° Celsius. Yutu is 1.5 meters tall and weighs approximately 120 kilograms. Chang’e 3 is China’s third mission to the Moon. Chang’e 1 and Chang’e 2 were both lunar orbiting missions. They launched in 2007 and 2010 respectively. China’s Long March 3B rocket launches from the Xichang Satellite Launch Center in the Sichuan province at 1:30am Beijing time on December 2, 2013. Atop this rocket sits the robotic Chang’e 3 Moon lander and Yutu rover. 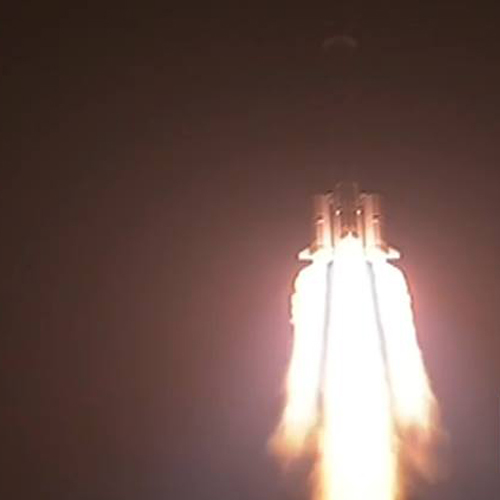 China’s Long March 3B rocket successful separates its second and third stages. China’s Chang’e 3 is seen moments after successfully separating from its launch rocket on December 2, 2013 Beijing time. 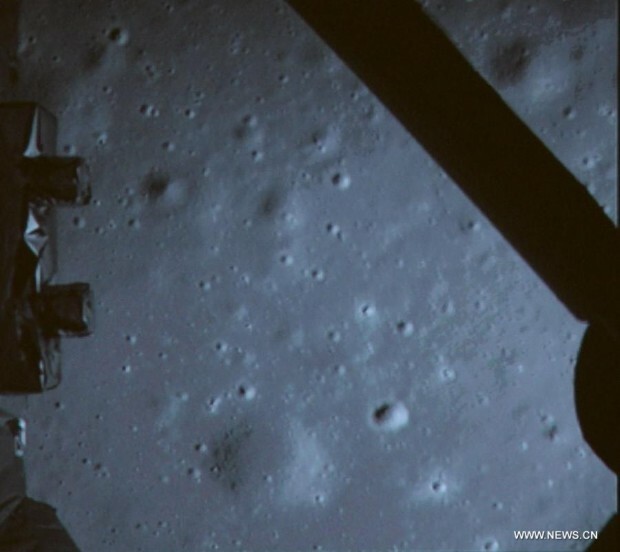 The robotic Chang’e 3 mission is on route to a December 14 landing on the Moon. Harrison lives in Ottawa, Canada. He works in politics and is passionate about many things, including space and exploration. He's worked for a national news outlet, managing the digital products, writing news, and appearing on air to talk about science, technology, and politics. In his spare time he enjoys astronomy, scuba diving, flying airplanes, photography, and sports.